Josh Spaniol knew the numbers weren’t good. But he worked the calculation anyway. It’s hard, after all, not to look at the train wreck. 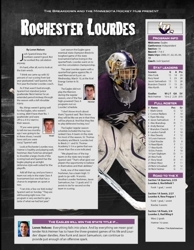 “I think we came up with 92 percent of our scoring from last year graduated,” said Spaniol, the first-year Rochester Lourdes coach. As if that wasn’t bad enough, Spaniol lost standout junior goaltender Nick Heimer for an extended period midway through the season with a left shoulder injury. No, things weren’t going well for the Eagles, who weren’t scoring, didn’t have their No. 1 goaltender and were off to a 4-4-2 start to their season. “If you were going to tell me two months ago I was going to be in these shoes, I would have said you were crazy,” Spaniol said. Eagles playing an airtight defensive style well-suited for the playoffs. Add all that up, and you have a team not only in the state Class A tournament but one that has a chance to engineer an upset or two. Last season the Eagles gave eventual state champion Breck its toughest game of the state tournament before losing in the quarterfinals. Lourdes went on to win the consolation championship. This year Lourdes opens with a quarterfinal game against No. 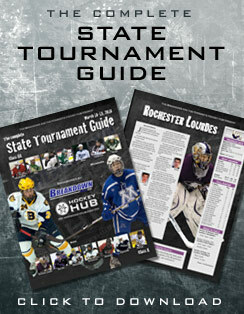 4 seed Warroad at 8 p.m. on Wednesday, March 10, at the Xcel Energy Center in St. Paul. The Eagles did not play the Warriors during the regular season, one of the few high-powered Class A programs not on Lourdes’ schedule. Academy 5-3 in a game that was closer than the score indicated. Funk, one of the state’s best freshmen, has a team-high 15 goals to go with 14 assists. Another Lourdes freshman, Jason Samuelson, has 13 goals and 15 assists to tie for second on the team in scoring.